Our company wants to plant wildflowers on our property. How do I know how much seed, what type of seeds, how to care for, how to plant, basically everything? Finally, we hope to find use some deer-resistant wildflowers. Any information you could supply would be greatly appreciated. The Lady Bird Johnson Wildflower Center, home of Mr. Smarty Plants, is in Austin, TX but our Native Plant Database has many plants listed that are native to your part of the country. We will try to walk you through the steps you need to take. Begin with finding the right native wildflowers for your area by going to the US Wildflower Database for Maryland. Each picture has a link beneath it - you can click on that link and get more information on it. Be careful, on this list, below the Scientific Name, you may see the word "Introduced, " which means it is not native, not to Maryland or even not to North America. We would also suggest that you contact the Native Plant Society of Maryland, and click on "Chapters" on the Home Page to see if you can find a group near you that can give you more local help. We are going to go to our Native Plant Database, scroll down the page to "Combination Search" and, using the selection bar on the right hand, select on Maryland for state, "Herbs" (herbaceous blooming plants) under HABIT and then check whatever other characteristics you want, such as height, color and bloom time, light availability, etc. 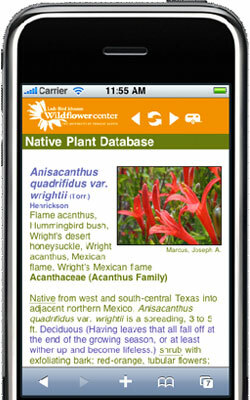 Also, on the top line of every page of that database is "Search Native Plant Database" and a box in which you can type the scientific (preferred) or common name of a plant, click on GO and that will take you to our webpage on that plant, where you can learn its growing conditions, light needs, benefit to wildlife, color and time of bloom, soil preference, etc. If you are growing plants native to your area, you have a much higher probability of choosing plants for which you have the correct soils, climate and rainfall. You will need to check for the amount of sunlight each plant needs. We categorize sunlight requirements as "Sun", more than 6 hours a day of sun, "Part Shade," 2 to 6 hours of sunlight a day, and "Shade" as 2 hours or less of sun a day. If some parts of the proposed garden are in some shade from structures or trees, you need to observe the area and determine how much sun is on each area. This will vary according to season, so we like to suggest this be done over several seasons, but you probably don't want to wait for that. To test this out and help you find your way through our database, we will select 12 wildflowers from the US Wildflower Database for Maryland, and run them through the our Database. Our webpages will give you information on propagation (seed? cutting? transplant? ), and sometimes places where the plant can be seen or purchased. May 11, 2015 - Is it possible to start wildflower seeds in pots in the spring and then transplant them to the yard? October 03, 2007 - I have recently acquired some Eve's Necklace seed pods. In order to plant them, do I need to open the pod to get to the seed, or do I just plant the pod? Should I soak or scarify the pod/seed?